BASF’s Ultrason E polyethersulfones are amorphous highperformance thermoplastics, functioning as heat-resistant impact modifi ers in thermoset resins and composites. Specific grades are available in the form of fl akes, functionalized fl akes and functionalized powders, optimized for easy incorporation into epoxy resins. On account of their thermo-mechanical characteristics and favorable fire, smoke and toxicity (FST) properties, Ultrason E polyethersulfones impart higher impact resistance and improved fl ame retardance to epoxy-based formulations and prepregs. The most limiting constraint to the use of epoxy-based composites manufactured by wet or dry hand lay-up techniques is the inherent brittleness of these materials. Adding Ultrason E polyethersulfones to the epoxy mitigates this problem by reducing the cracking tendency and increasing the impact strength of glass and carbon filled prepregs without compromising high glass transition temperatures, modulus and strength-to-weight ratios. As an added benefit, the inherently flame retardant Ultrason E polyethersulfones contributes to improved FST properties of the composite. BASF offers three grades suitable for epoxy impact modification. Their product forms are designed for easy incorporation into epoxy. The flake form of Ultrason E 2020 P facilitates the dissolution in epoxy. Ultrason E 2020 P SR, also in the form of flakes, is hydroxy-functionalized for covalent bonding to the epoxy matrix, enhancing the compatibility with the matrix material. Ultrason E 2020 P SR micro is a hydroxy-functionalized, micronized powder, offering optimal features for easy dissolution and compatibility. Typically, up to 25 wt% of the functionalized grades can be dissolved in epoxy. The bulk/mechanical properties of the Ultrason E 2020 P specialty grades are typical of high performance amorphous thermoplastics. Additional properties such as viscosity, hydroxy content and particle sizes defi ne the quality of functionalized grades. Ultrason E 2020 P SR (micro) excels in terms of low viscosities and high hydroxy contents. 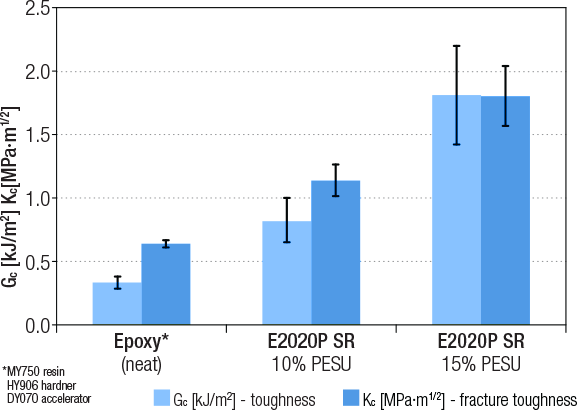 ​High performance epoxies can take advatage of the improved impact resistance without compromising on the high glass transition temperature and stiffness. 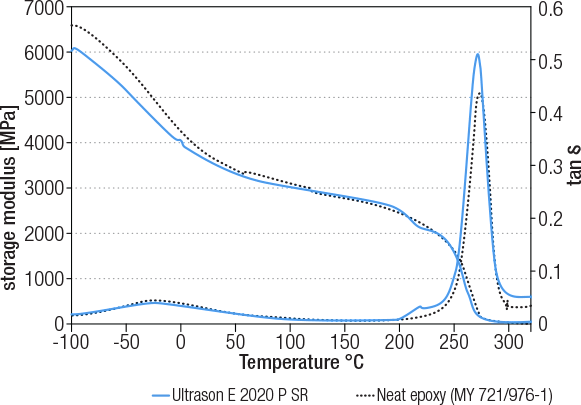 This can be seen from the temperature dependence of tan delta and storage modulus for neat epoxy and modifi ed with Ultrason E 2020 P SR, respectively. 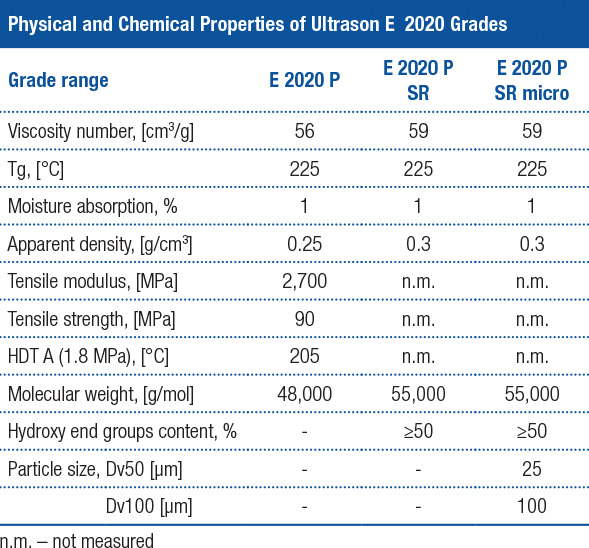 ​Ultrason E 2020 P SR (micro) grades differ from natural Ultrason E merely in terms of product form and/or functionalization. They share the inherent flame retardance of all polyarylethersulfones. Consequently, the will improve the overall FST properties of epoxy-based composites that do not otherwise contain flame retardants.